As you may have seen in my previous post, "What's In My Travel Makeup Bag", I'm currently on holiday and decided to share with you all the beauty products I'm travelling with. I didn't want the post to be huge, so I decided to split it into 2. 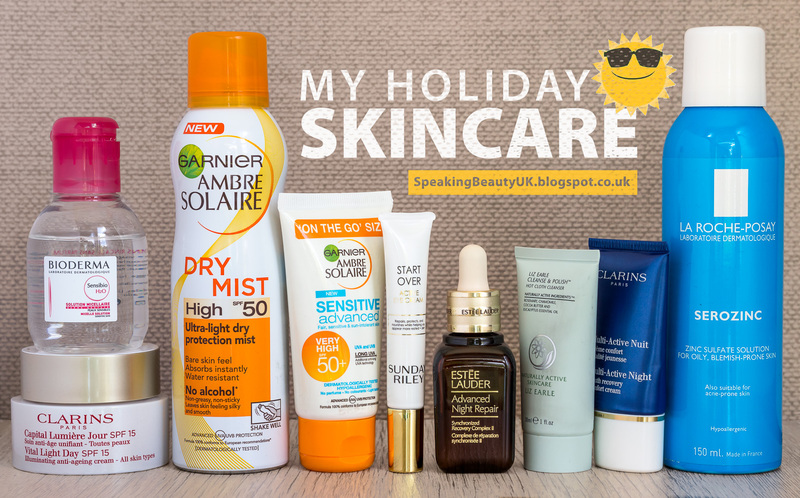 And now it's time to show you my holiday skincare essentials. - Clarins Vital Light Day SPF15. This is a new product that I was kindly sent by Fragrance Direct. I'm still testing it but expect a review coming your way soon. So far, I love that it has SPF as I enjoy having both hydration and sun protection in one product. Who wants to spend hours applying products while on holiday, right? - Sunday Riley Start Over Eye Cream. Also a new product that I will report back once I've tried it enough. I'll be wearing this both day and night. - Estée Lauder Overnight Repair Serum. Such a great overnight product to hydrate and plump the skin. It goes with me everywhere. It's light and therefore perfect underneath any moisturiser. - Clarins Multi Active Night Moisturiser. As you can see, I'm a huge Clarins fan when it comes to skincare. This was a sample I got with a purchase and I love it. Very rich and creamy, smells lovely and makes my skin feel really soft in the morning. - Bioderma Micellar Cleansing Water. Love this as my 1st cleanser. Everyone and their mother knows this product so I won't go on about it much. Just love how well it removes everything, without leaving residue behind, just like water. - Liz Earle Cleanse & Polish. This cleanser always comes with me. It's my 2nd cleanser. I love it. It's very creamy, removes all my makeup (even mascara) and I have it in travel size so it's brilliant. - Garnier Ambre Solaire Dry Mist SPF50. Really love this product! My favourite sun protection ever. Smells lovely, like perfume, and dries super fast. Will always repurchase. - La Roche Posay Serozinc. Unfortunately I have not seen much change in my skin since I bought this but I got my husband into trying it too and he has noticed great results. He now gets fewer spots and a lot less frequently. So I wonder if it's my skin type that's not ideal for it? God knows! But I've decided to bring it with us, instead of a water spray, because the mist is very fine and it'll keep us cool, while also adding some goodness to our skin. I didn't include a mask on the photo above but in the last minute I decided to take one, as I got a sample size of the Elemis Papaya Enzyme Peel with the Marie Claire July edition & I'm really enjoying it. Smells amazing and leaves my skin feeling really soft. Still testing it but so far so good. If you live in the UK, I highly recommend picking up the magazine with the Elemis freebie. So this is it for skincare. At home, I'd also have exfoliating toners, hydrating toners, facial oils, etc. But when I'm abroad I like carrying as little as possible so these are my absolute must have.